COMPANY PROFILE Deutsche Bank AG is a leading private bank. It offers investment, financial and related products and services to private individuals, corporate entities and institutional clients around the world. Headquarters based in Frankfurt, Deutsche Bank is Germany’s leading private bank, with a strong presence in Europe, America, and Asia-Pacific. The bank largely maintains its roots in Germany, where 30% of total banking revenue is driven. With its revised business restructuring program the bank’s business model will be based on three main divisions: Corporate & Investment Bank, Private & Commercial Bank, and Deutsche Asset Management. The bank is looking to IPO a minority stake in the asset management business within two years. 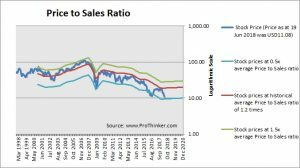 At the price of USD11.08 as at 19 Jun 2018, Deutsche Bank Ag is trading at a Price to Sales Ratio of 0.7 times last 12 months sales. 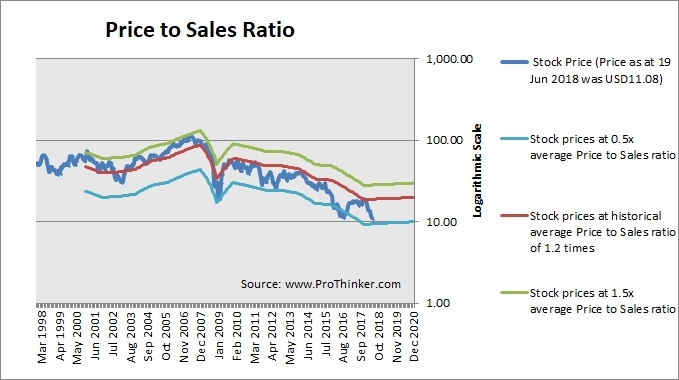 This is a 41.0% discount to its historical average Price to Sales Ratio of 1.2 times.